Barriers or Starting Blocks? Turning Obstacles to Culture Fit Assessment Into Strategic Talent Opportunity! - Recruit better. Hire better. 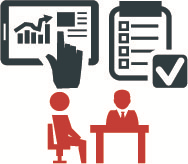 | Streamline Your Talent Assessment with DeGarmo. There is a lot of buzz about “culture” these days, but when it comes to using culture to drive strategic talent selection and development, there seem to be some barriers keeping organizations from being able to provide measurable insights into culture fit. DeGarmo recently polled 589 (mostly HR) professionals to gather insight into what they believe may be holding organizations back from measuring culture fit. The three main reasons cited: Cost: 38% of respondents indicated that decision makers in their organization either do not believe measuring culture fit is worth the cost, or that measuring culture fit is too costly (due to a lack of budget or resources). Time: 30% of respondents indicated there is a perception that measuring culture fit is not worth the time, or that it takes too much time. Knowledge: 32% of respondents indicated there is a lack of knowledge about measuring culture fit which holds organizations back from doing so. In a case study outlined by DeGarmo, “Strong Culture Fit Keys Valued Outcomes,” Russ Nykaza, former VP of HR at US Cellular, highlights the successes of providing metric-driven insights to drive culture fit through talent solutions, but noted he knew early on it wouldn’t be easy, stating, “When we first engaged DeGarmo, we knew it would be a major change initiative.” So what are ways that your organization can pursue success with implementing culture fit insights into your organization? How can you overcome the barriers outlined above and turn them into strategic opportunity? Cost: At DeGarmo, we strongly believe that the conversation has to change from cost to opportunity – an opportunity to make an investment in talent. Cost is always a top factor in the HR world due to limited budgets and resources, but great companies still fin d ways to invest in their number one asset – talent! As highlighted in our recent post, “What is Organizational Culture? Why Values? and What Does Warren Buffet Have To Do With It?,” research by DeGarmo highlights that people with stronger indicators of culture fit report higher levels of job satisfaction, organizational commitment, fewer withdrawal cognitions (i.e., thoughts about eventual turnover), and are less likely to engage in turnover-related behaviors (e.g., looking for a new job). What is of great importance to note in regard to cost is that these job-related outcomes significantly relate to decreasing turnover, and turnover reductions optimize opportunity for ROI through HR programs. A recent discussion of “The Financial Impact of Human Resources” by Adam Bradshaw, Talent Assessment Consultant at DeGarmo, outlined the HR chain of tying soft data to hard business outcomes to drive ROI. In short, he discussed that outcomes related to culture fit provide ample opportunity to make an impact on the bottom line of any organization. So turn the conversation of cost into one about investment – invest in increasing your opportunity to bring in the right talent that fits with your culture to drive important job-related outcomes and ROI. Time: Timekia Faulkner, Senior HR Generalist with Illinois CancerCare, notes that culture fit solutions help them to, “make a successful hire, assessing a candidate’s fit within our company’s values.” Taking the time to measure your organization’s culture provides objective benchmarks to check your hiring decisions against. Without measurement tools, you have no objective reference to support your decisions or determine if your hiring decisions are actually predicting job-related outcomes. Moreover, with modern assessment technology, it doesn’t take much time to measure and understand your organizational culture! Want to establish a benchmark of your organizational culture to drive culture fit? It only takes about 15-20 minutes, and the data gleaned from doing so will not only determine the benchmark of your organization’s culture to help drive selection or employee development programs, but you’ll also have the data to determine whether or not your leadership actually agrees on what your organizational culture should look like to begin with. Knowledge: Finding an assessment provider you’re comfortable with, and that can meet your business needs and budget is essential. Communication is key! If you don’t communicate effectively to ensure that you have the right measurement tool in place to meet your business needs then chances for success are low! Russ Nykaza knew this first hand stating, ““what was important to us was that we had a strategic partner that we could work with and align our strategies with.” Ultimately, Nykaza was able to increase US Cellular’s “ability to retain the brightest and best in the workforce” which provided the strategic opportunity to thrive as an organization. How will you re-orient your focus around these 3 barriers to make them a strategic focus and increase the odds of successfully implementing a culture fit tool to drive organizational effectiveness within your organization? About DeGarmo DeGarmo develops and distributes innovative talent assessment and development solutions to help clients maximize revenue growth, productivity, and workforce stability. Our award-winning pre-employment assessments, leadership assessments, and training solutions have been delivered to millions of job candidates worldwide through our talent platform, or through integrations with major applicant tracking system (ATS) providers. More than 10,000 HR professionals have received HRCI or SHRM certification credits through DeGarmo’s webinars on critical HR topics such as talent assessment, interviewing, leadership, turnover reduction, and culture fit.